The High-resolution Airborne Wideband Camera-plus (HAWC+) is a Facility class Science Instrument. HAWC+ is a far-infrared camera and imaging polarimeter. It is designed to allow total and polarized flux imaging in five broad bands between wavelengths of 50 μm and 240 μm. Diffraction-limited imaging yields spatial resolutions of ~5 – 20 arcseconds with fields of view ~2 – 10 arcminutes, respectively. HAWC+ utilizes two 64x40 pixel arrays of bolometer detectors, one for each component of linear polarization. 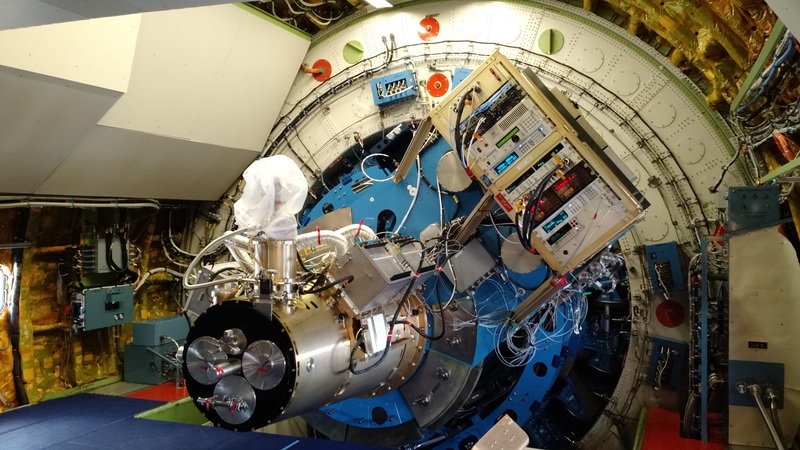 The detectors are cooled by an adiabatic demagnetization refrigerator to an operating temperature of about 0.1 – 0.2 K. Commissioning observations started in late 2016, the instrument acceptance review was completed in late 2017, and will be available for Cycle 7 observations beginning in 2018. Information applicable to the current observing cycle, Cycle 6, can be found in the HAWC+ chapter of the Cycle 6 Observer's Handbook. Those submitting proposals for Cycle 7 must refer to the HAWC+ chapter of the Cycle 7 Observer's Handbook. Be sure that you are referencing the correct version of the handbook!